You see the ads everywhere online. Don’t! There are numerous posts on why you shouldn’t buy Facebook likes. We agree with Social Nicole and JP Marketing. In summary, here are their reasons why you shouldn’t buy Facebook likes. You’ll waste money promoting to bogus accounts when you start your Facebook ads. You’ll have fans, but they won’t like or share your posts which FB’s algorithms will take into account. They will then lower how many legitimate fans see your Facebook content because of a penalty. Many of these new fans will unlike you over time when you secure them through a Buy Facebook Likes wholesalers. A sudden surge of new likes will cause Facebook to look at your page, and possibly take it down when they see you violating their terms of service. Here’s another reason why you shouldn’t buy Facebook likes. A reason which no one is warning you about, bad Facebook reviews. Recently a company we know ignored sound advice (not our clients, they’d never do this nor would we) and bought Facebook likes to “get them started.” Many of these Facebook profiles were overseas accounts that the wholesaler used to supply the likes the company purchased. 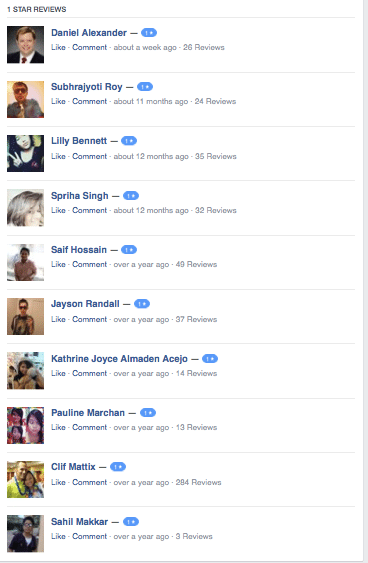 Some of these likes also decided to leave reviews on the company’s Facebook page. That’s right, they left indiscriminate reviews where they clicked a random star even though they had done no real business with the company and wouldn’t have ever reviewed the company had they been added as a part of a wholesale fan package. The worse news for this company, many of these purchased likes clicked a 1-Star or 2-Star rating. In talking to the business owner, only ONE of the negative likes was a true customer. These random, low-star receives drove down the overall review rating of the company. This dropped their 5-star reviews from their legitimate customers to a 3.5 rating! Your star rating is one of the first things people see on your company’s profile page. Facebook doesn’t require comments in a review, so there is no real way for your potential customers to see the cause of the low review to determine if it is a legitimate complaint. Don’t buy Facebook likes. Build your following on Facebook honestly with valuable content (not cat pictures and other “nontent” unless you actually do things with or to cats..ha!). Even better, use targeted Facebook advertising to drive people straight to your website to draw in genuine customers, clients, and patients that will ultimately spend their money with you. Moon & Owl Marketing offers social media services to businesses and organizations. We don’t buy Facebook likes, EVER.